It has indeed been aptly stated that- “Fitness is like marriage! 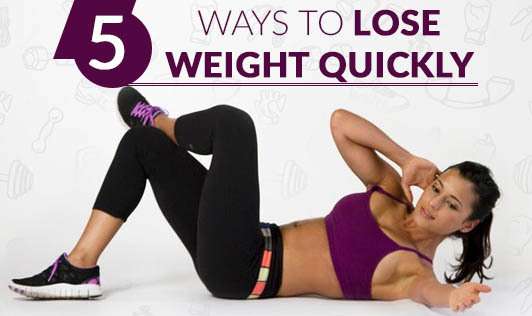 You can’t cheat on it and expect it to work.” That being said, there are however a few quick and easy ways you can adopt to speed up the process of weight loss. Here we list five harmless diet tweaks you can make to lose weight quickly. Eat a low GI diet. A low GI (Glycemic Index) meal takes longer to digest and releases sugar into the bloodstream more slowly than a high GI meal. Avoid high GI foods like white bread, croissants, and cornflakes. Whole grain bread, milk, chicken, fish, and most fruit and vegetables are good examples of low GI foods. Eat in combos. Whole-wheat vegetable sandwich, chicken and veggies, fish and veggies- these are all combinations of vegetables with carbs or proteins. These combinations work quickly to rev your BMR (basal metabolic rate), leaving your body to extract fats from the exsisting body fat instead of food. Replace bad fats with good fats. Have a whole-wheat vegetable sandwich but replace butter with extra-virgin olive oil. This way you get to eliminate the bad fat and include the good fat from virgin olive oil to give your HDL a boost and aid in weight loss. Yes, you need good fats to lose weight. Eat a high-protein diet. This tiny tweak involves mixing in a tablespoon of oat bran into your egg white mixture. At lunch, you can have two pieces of chicken or and two fillets of fish. Follow this for 6 days and add in 25 minutes of walking. Make sure you drink loads of water to stay hydrated. By making this simple change, it is possible to lose up to 2.5 to 3 kg in six days. Dinner can be salad or soup. Eat normal food through the day, and at 7.30 pm, replace dinner with a large bowl of soup or salad (use extra virgin olive oil as dressing) to fill up. Replacing regular dinner with this option (and occasionally combining it with two glasses of red wine), can help you knock off as much as 2 kg over two weeks.